I started fantasizing about these pancakes and they quickly evolved into a full blown brunch meal. There are two ways to do this recipe, one is spicy and has Canadian bacon or ham and eggs, and one is sweet. 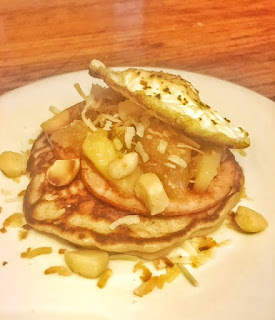 It is entirely up to you how far you take them because as pancakes with yummy pineapple topping they were amazing, but with the Canadian bacon and runny egg it becomes and epic meal that will make your kitchen the new brunch spot. I use Kodiak Cakes brand pancake mix because they are higher in protein than normal pancake mix and whole grain but use whatever brand pancake mix you like or you can make pancakes from scratch. Optional Egg and Canadian bacon or ham cooked to your liking. In a dry skillet add coconut flakes and toast the coconut, stir it around until it is just browning then remove it from the pan and set it aside. In the same pan toast the macadamia nuts, just lightly to give them an even nuttier flavor, let them cool and chop them. Reserve some chopped macadamia nuts and some toasted coconut to top off your plates. In a medium pot add the pineapple, and light brown sugar, bring to a boil, lower the flame to medium and let simmer until it thickens, about 8 to 10 minutes. If you want to add the rum, drain the pineapple and add the rum in place of the canned juices. If you want to add the jalapeno, add it after the liquid boils and let it cook down with the pineapple mixture. If you are using the recipe above add Kodiak cakes mix, one egg, and one cup of milk to a bowl, add cinnamon and mix until well combined. Add coconut and macadamia nuts and mix until combined. Pour approximately ¼ cup batter into hot pan and turn flame to medium, wait until the edges bubble and flip. Just an FYI, typically the first pancake is sacrificial, I like to call it a snack, but normally the first one gives you an idea as to how hot your pan is and how long you need to cook them. Cooking isn’t a science, some people like their pancakes a little less cooked, some a little more. This makes approximately 6 pancakes. Top your pancakes with the sweetened pineapple sauce, some toasted coconut and macadamias, and if you’re feeling extra fancy some whipped cream. If you want to turn this into brunch, add the spicy pineapple jam, add your cooked Canadian bacon or ham, and an egg. You can use the extra, if there is any, pineapple topping on ice cream! I liked both the sweet and sweet spicy version so much I couldn’t decide so you got a super recipe!